The ChocOle is a big capacity Hot Chocolate Maker. Pour heated milk into the hot chocolate maker and add your favourite hot chocolate mix. Then combine the milk and hot chocolate powder effectively by plunging the handle repeatedly. This allows the propeller to mix the hot chocolate, and produce a frothy consistency. Then serve directly from the heat resistant jug with stay-cool plastic handle. The vessel is dishwasher safe, but cannot be used in a microwave. 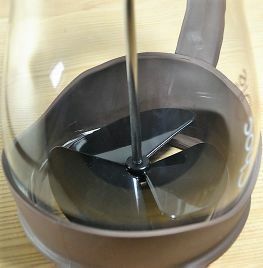 If hot chocolate is not your choice of the day - the ChocOle is suitable for creating and mixing milkshakes, frappuccinos, even cocktails.